Here’s another eco-gadget to make your morning routine a little more earth friendly. Instead of just jamming your juicer and pressing a button, go the eco-friendly route. Instead, put all the items you want juiced into it and grab the hand crank. Usually juicers make your morning more convenient and quick. 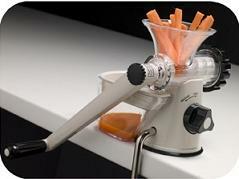 However, this one might be a little easier than no juicer at all, but it’s nowhere near as easy as an electronic model. It can do the usual items, like oranges, carrots, apples, lemons or things like ginger and wheat/barley. It is easy to disassemble, which makes it easy to clean back up again. Unfortunately, it can’t be put through the dishwasher, despite that it’s no longer electronic. It is a great product for those that love eco-friendly products, however, it’s unlikely that the general public would be overly excited about it. You can purchase it on the Ecoutlet for £29.95 or about $42. Unfortunately, as of now they’re out of stock. Is it me or will the Kindle 2 be uglier than the First? Sometimes low-tech is the way to go. Plus this could help build some upper body strength, especially when you got to get 4 glasses ready each morning.